Whatever you do this Thanksgiving, do not discard your Turkey carcass! It has so many nutrients to give you! Once you have carved most of the meat off of your bird, just leave the hard to get pieces on the bone and stick that baby in large pot. It's time to make some soup! Feel free to make a smaller batch than this. I don't do anything in small batches. This will feed 6 people a couple times, just the way I like it. 10- 20 lb - carcass of a turkey plus any extra skin, the neck, heart, liver etc.. (even if it's already been used to make gravy, add it to your carcass). This recipe was done using about a 14 pound turkey's carcass with about a cup of added meat. The more bones, the more flavor! Tip: Whenever you use celery save the leaves in a container in the freezer and use them instead of actual celery whenever you are making a broth. Tip: If you are dairy or gluten free either skip the roux altogether and just have a more watery soup or use an alternative fat and/or thickener. 1. Place the turkey in a large pot and fill it with enough water to cover the carcass. Add whole celery sticks, carrots, onion, garlic, bay leaf, salt and pepper. Boil for 30 minutes or so and then simmer for several hours or even overnight on low. Skim off the foam as it cooks. Cook for 2 hours minimum. Tip: Add a little rice vinegar to the broth to help extract more nutrients and flavor from the bones. Tip: Don't worry about exactly how much water to add. If in the end you have a lot of broth and think you need to add too or reduce from the veggies or take out some broth and freeze it than do that. It's your soup; treat it like an art not a science. I prefer to have bites of veggies, turkey and rice in every bite. 2. Strain the broth reserving the stock. Return it to the original or a larger pot. Discard cooked vegetables and bay leaf. Set turkey bones and meat aside. 1. Bring broth to a boil, add diced celery, sliced, carrots, chopped onions, salt and pepper. Simmer for 1 hr. 2. Debone turkey reserving all bits of meat. Sneak in as much skin and other flavorful bits of turkey as you are willing to try. Add turkey, stewed tomatoes and Tabasco to the soup pot. Tip: For those really opposed to spicy foods reduce the amount of Tabasco. My kids will not eat this if I put the full amount in so I just season my personal bowl of soup as I eat it. It really is a crucial ingredient in my opinion! 2. Add flour whisking steadily for 3-4 minutes. 3. Slowly add 1 cup of broth from the soup stirring well. Keep adding broth up to 3 or 4 cups as it thickens. 4. Add the roux to the soup stirring vigorously. This soup is delicious, resourceful and nutritious! Feel free to add more turkey meat from what was carved away if you want more chunks of meat in your soup. You could also add okra or any other of your favorite veggies. If you are a diehard noodle fan, sub noodles for rice. Enjoy! I still don't recommend discarding your turkey bones and chunks of skin you didn't put in the soup. This turkey still has more to give you! Boil the bones, skin and cartilage one more time with another stalk of celery, carrot, onion and bay leaf, salt and pepper. Simmer on low overnight to leach as much delicious and healing nutrients form the bones and cartilage. Strain the liquid and then can or freeze the broth for future cooking and consumption. Well, like usual, I did not finish everything I had hoped to this summer. But then if I had, what in the world would I do with my time after the rain ceases and the earth warms again in the spring? I finally cut down the last of the dahlias, trimmed the roses and stored the sun umbrella in the garage. I think I'm finally (several weeks late) ready for fall. Now if life could calm itself just long enough to allow for some homemade chili, crocheting and maybe.... a touch of indoor remodeling! Here it is, still not 100% complete but if I wait for that moment I may never post pictures. Here is my chicken coop kid's fort combo. Though I did most of the work this summer, the idea came several years ago after we moved to our current home. 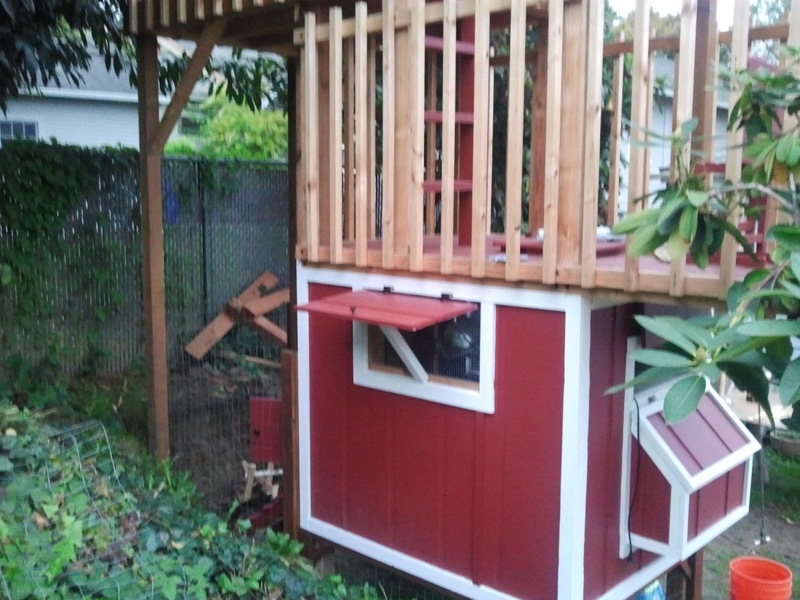 When we moved into this house which came with a miniature yard, the old chicken coop was the first thing to go. I knew if I wanted chickens I would have to sneak them into the yard. At first I was just going to build a long and narrow coop and put it right up against the fence but then I thought, why not combine the chicken space with kid space by building a fort on top of the coop! So that is what I did, problem solved. 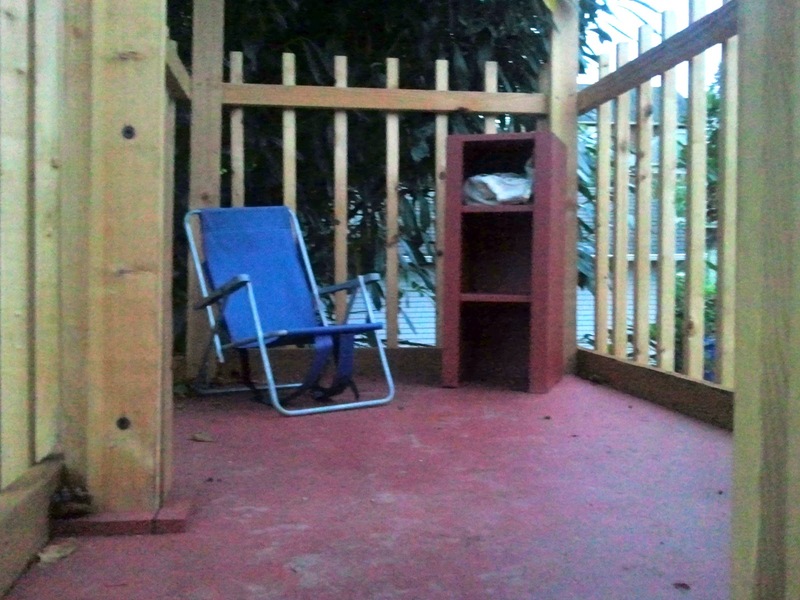 I thank my husband, Jason for only freaking out minimally and infrequently, "You want to build it how high?" "You're going back to Home Depot again today?" Thank you Jason for holding down the real fort from dawn until dusk all weekend every weekend for a while so I could get some stuff done. Thanks for your muscles and for digging the first hole for the first post which led to the rest. Oh, and thanks for telling people when they complement you on your fort that your wife built it. I love you! I thank my kids for actually thinking I was going to build this just because I said I was. Also for eating peanut butter spoons and banana's for dinner on multiple occasions because I was working outside till dark or later. Thank you for being the inspiration for this all! I love you to pieces! I thank my friend Joyce who had already built her kids a fort! She told me where I could get the 16 foot posts delivered to my home (thank you Lowes) and was a big help in giving me the courage to get those posts in the ground. Thanks for letting me come see your fort and for being soooo awesome in general! I thank my dad for telling me how to do it and all his invaluable help at many steps in the process. I was going to layer a coop on top of a base and then put a fort on top of the coop. He told me to build the entire structure along the 4x4's which would be buried in the ground and go all the way up through the layers of the coop and fort so it would be one coherent and sturdy structure. 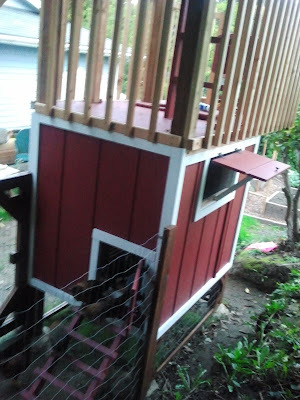 He also sent me pictures of his fort (for the grandkids) and let me copy his stairs and gave me the idea to have a pulley attached to a bucket for the kids to play with. He is my "go to" person even though he lives thousands of miles away. Somehow he always knows what I am talking about over the phone even though I don't know any proper construction lingo. Thanks Dad. OK, I know I'm pushing it, it's not like I just wrote a novel, if you are still reading I'm almost finished and there are more pictures at the end. I would like to thank my mom because when she was alive she did random things like build a wood floor out of the pieces of a gym floor she found in the shed. She changed the brakes on an old Volkswagen bug before you could Google how to do that. Pretty much, she did whatever the hell she wanted and I love that I am her girl! I'm grateful to my carpenter neighbor for shaking my structure and telling me (and my husband) that it is sturdy, for telling me I do better work than his apprentices and in general for boosting my confidence (or ego - fine line). Thanks for the pointers and tips like how many feet down the supports should go. Thank you my dear friends and sisters for continual feedback and encouragement! I'm sure there are more but I think I've milked this as much as I can. This was like my five minutes and for that I thank you readers! I hope you enjoy the pictures and perhaps gain some inspiration for your own cool ideas that might be cooking in your head! Just mention them out loud to your kids and it might actually happen! Here are the stairs going up to the first level of the fort. This is the east side, you can also see the nesting boxes where I will be collecting eggs from in a matter of months and another window! The kids play with this pulley a lot. It truly is convenient for getting toys and things in and out of the fort. It is built off one of the 4X4 post on the fort's lower level. At the end of the rope is a five gallon bucket. We finally have a home for this bird house my daughter has had for over a year! I just attached it to one of the 4x4 posts on the first level. It is across from the pulley. Top level of the fort. This is the view from the top level of the fort. View with the slats in the picture. I put these boards up just as a guarantee that no crazy kid would ever try to get on the lower roof from the upper level! Can't be too careful when it comes to kids - you never know what they might do! 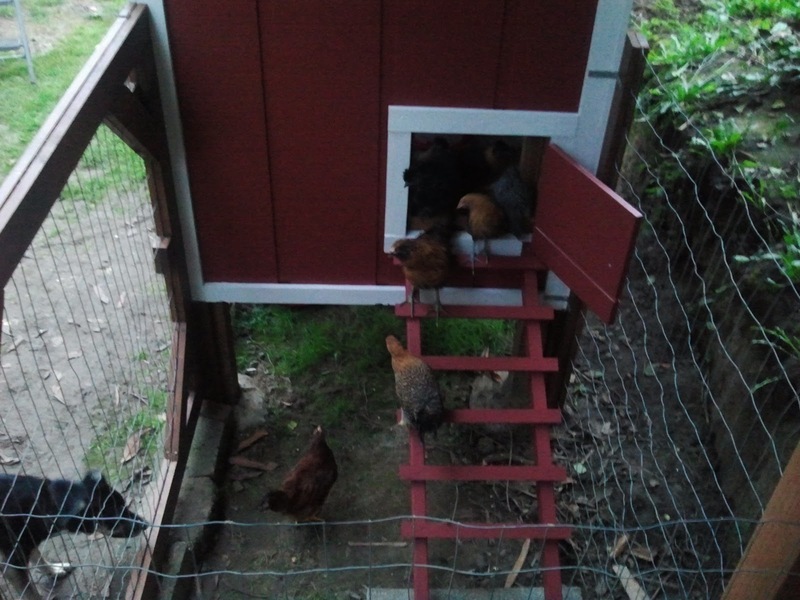 Here are the chickens' stairs. The chickens exit the coop on the west side and go into a fenced off pen. They can also go under the coop. Their door stays open all the time but I certainly have the option of closing it if I need them in or out for some reason. When we finish the yard their pen will be a little larger. We also let them out into the yard sometimes especially as evening nears since they always go back to their coop to roost at dusk. When our yard is fenced in I will let them out for longer periods of time during the day. The ladies- they are teens right now not fully grown. You can see a little bit of the entrance to the nesting box on the left, the droppings pits are under the roost. The water in the picture is no longer there; their water is under the coop now. That was just for when they first arrived in the coop and I kept them locked in it for the first few day. Their food is suspended from the roof and hangs a couple inches from the floor. Get a big tub. I used an old tub from store bought detergent (I save things like that) which is probably close to a 4 gallon tub. I think 2 gallons would be sufficient. That's it! Use 1/8 cup per load. I have a high efficiency washer and have had no problems using this soap with it. I write the ingredients right on my tub so I don't have to go looking for the recipe when I need to remake it and to keep me from losing the recipe. I don't need any reasons to put things off so cutting out the step, "find recipe," helps me. I changed the recipe a tiny bit for simplicity so I could use for example, 1 Box - Borax which is 11 cups instead of the recipe's 12 cups - Borax. I mean, who has time to measure Borax. The recipe calls for 8 cups of grated castile soap. One 5oz bar is about 1 & 3/4 cups so you decide, use 4 bars or 5 - it's not worth using 3/4 of a bar. Also I don't use the recommended 3 tablespoons of essential oil. That much essential oil is half the cost of all the other ingredients. Instead I simply used scented castile soap - problem solved! If you give this a try I hope you enjoy it as much as I have and I welcome your feedback! I get a real kick out of simple yet effective household products. Check out my latest find. I went to a local new and mostly used shop to get some hooks (that project coming later!) and happened upon this little jewel. I love the wisps of the petals and the earthy colors but best of all I love the texture. This is fabric on fabric! Maybe even homemade! I found a home for it right away. There comes a time in every chick's life when they are no longer cute, cuddly or adorable, when the excitement fades and the little chirping chicks turn into annoying chirping chickens. There comes a time when their precious little fuzzy fluff turns to feathers and all you notice anymore is their stink. There comes a time when the dust they emit is no longer tolerable but down right disgusting and annoying. That time came early for me with these chicks - weeks early. Perhaps it's because there are more of them this time. Maybe it's because they are in my dining room instead of the little nook of a room we had in the house we occupied last time we had chicks. It could be the fact that the stress over finishing their coop has been mounting every day while I have had to plot and plan for even minutes to work on the stuff that should have been finished weeks ago. Our precious little chirping, smelly, dust emitting chickens should have been out of my house and in their coop last Monday at the latest. They no longer need a heat lamp and anyway, I could have just used one in the coop. Today is the day. 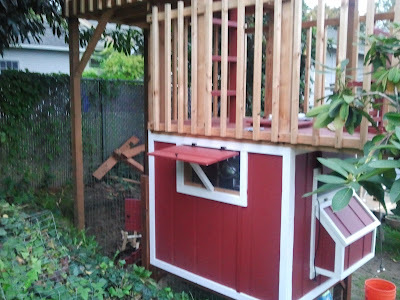 I don't care what is or is not finished on the chickens' coop. If I have to make them live in the kids fort, that is what I will do. THE CHICKENS LEAVE MY HOUSE TODAY! I've been saying this for weeks but I really am close to completing their coop. I still have some painting to do on the outside, some hardware to add and tweaks here and there but the fencing I was working on is complete, the droppings pits I've been putting off are almost finished and their ladder is just waiting for some paint! Door handles and other details can wait. I refuse to clean out their cardboard box one more time. One of two droppings pits. Tis the season to be fermenting! Fall is an amazing time to get some foods going! There are so many things in season just begging to get bubbly: things like cabbage for sauerkraut, kimchi and cortido to apple cider and cucumbers for making pickles. One of the easiest things for me to ferment is root veggies. I'm not a real big beet, turnip, rutabaga type of person. I have tried to implement turnip and beets into my kitchen and I just can't get into them. I think I’m still traumatized from being forced to sit at the table until I ate my beets as a child, it's one of the few foods I don't like. I blame it on my location that I was just never introduced to turnips as a child. I have learned though that I do really like root vegetables once they are fermented and believe it or not, my kids like them too! Fermenting food is a traditional way of preserving foods and quite frankly the natural process and unavoidable way of living before a "sterile" world. It is the breakdown of sugars into lactic acid which acts to preserves the food or drink by inhibiting spoiling bacteria. Given the proper environment many, many foods benefit from fermentation and increase in nutritional value, digestibility, and enzymes. One of the biggest benefits of consuming fermented foods is the beneficial bacteria which help in the growth of flora in the intestine which is guards our gut from disease and negative bacteria. Today, especially in the U.S., we are grossly lacking healthy bacteria in general. Instead of relying on a healthy gut to keep us safe from harm we rely on sterile conditions of our environment to keep harm from our gut. That’s impossible however and works against us. All the antibiotics we feed ourselves and the animals we consume work to kill the healthy bacteria in our gut. Of course, with the way our animals are typically fed and housed, it would be almost insane to not feed them antibiotics… but I am getting off track. My point is that fermented foods are very, very, very good for us and quite possibly the healthiest way to eat food ever. A couple days ago I started my first of the season fermented root veggies! I used mostly turnips, a few radishes, a giant gold beet and a few chopped green onions. I sliced them all fairly thick so they wouldn’t get mushy. I sprinkled all the veggies with salt as I sliced them and threw them into a bowl so I could get them all mixed up. Then I packed them into a jar and pressed them in firmly and tightly. After a few minutes the salt and compacting pulled out a fair amount of liquid from the veggies, in this case though it wasn’t enough brine to cover the vegetables all the way. If I had shredded them instead of slicing them I’m sure there would have been enough, but no matter, I just added a little water and two tablespoons of whey for the half gallon jar and one tablespoon of whey for the quart. Salt water to the top would have been good as well if I didn't have any whey. I used half pint jars full of water to weigh down the vegetables and keep them submerged in the brine. In two days my roots were delicious with beautiful bubbles rising to the top. Day three I declared them perfect, a quick process for sure. You can leave the veggies fermenting as long as you like, my kids will more readily consume them if they are crisp which I have noticed means a shorter fermenting time. Three days is the earlier of time frames. I would say for a lot of veggies a week is the norm but sauerkraut can actively ferment for months and months. It all has to do with the temperature of the room and personal preference. Some people just leave a pot of fermenting veggies out all the time constantly replenishing the stock with fresh vegetables. When I was satisfied with the level of fermentation I skimmed the foam off the top and wiped the inside of the top of the jar clean from any debris. In a perfect world I would have a cellar or cold storage place (read: in the earth like the pros in Asia do), but the world isn’t perfect so I just put them in my refrigerator. I have tried storing them in my garage which is half underground and cool in temperature - but out of sight, out of mind. I totally neglect what is not within my reach. Fermented foods are addictive. Once you start, you crave them! And they nourish you. Planter Box In The House! There is a real cute cafe in Oregon City called Singer Hill Cafe. The owner is always doing cool stuff with the architecture and plants inside and out of the cafe. Naturally, I take pictures of cool things as I see them. I love using other people’s ideas! Check out this super cool planter inside the café. Tonight I sprang the idea to my husband of building a planter box into our house and he went for it! We have three really wide stairs in our house that separate the upper level from the lower. Up the stairs is the living room which has two bedrooms off of it. Down the stairs you walk into the kitchen/entry/dining area and then to a hallway with more bedrooms. There isn’t much visual separation between the upstairs and downstairs. From the living room the view downstairs is of the kitchen and entry way. Way too many months ago we started building on a portion of the stairs, a book case on the living room side and a coat closet on the lower level. We were going to build it half way up and hang a stain glass window from the ceiling above the bookshelf/closet. The goal was to create a little divide between the wide open spaces. Our house came with very little storage space and certainly not a coat closet so it made sense. Maybe because the project was never really planned out precisely or properly executed and therefore came to a complete and utter standstill, I am not so sure of the closet/bookshelf idea anymore. I think it creates too much of a block between the levels and hinders the flow of the house. Maybe we will build a planter box like the one at Singer Hill to create some separation between the levels while keeping the space airy and at the same time contribute some beauty and live to our home! * Update - This is what we actually did with the space. This year I have decided to grow my tomatoes up, tying them to a cedar stick and pinching off the suckers so they don't get too heavy or lanky. Here is my original post about this year's tomatoes. I want to update you on how it is going. I am still very pleased with my tomatoes and have been harvesting a lot of delicious tomatoes. The puny plants that were just never doing much are still not doing much but the hearty ones are putting out loads and loads of big beautiful tomatoes. I wanted to let you know that I have had two cedar stakes snap on me! One was on a plant in the flower bed in my back yard. We had a descent wind storm a few weeks back while my family was out camping and I came home to this tomato plant, which was very large, on the ground. It had so many green tomatoes I couldn't bear to cut it down and while the main stock was damaged, it was still connected - just the stake snapped in half. I pruned the heck out of the plant and propped the stick back up and so far, so good. I think I am going to see a lot of red tomatoes on this one. The other plant that I had a stake fail on was out front by the street. It was a yellow pear cherry tomato plant. I wasn't super attached to it so I just cut the plant down and called it good. I have a bowl of the green tomatoes I salvaged before dumping the plant. They are already starting to turn yellow in my kitchen. The lesson of the season is that my plants need more support! I either need to prune more heavily and not let the plants get so large, use more than one stake per plant, or use something sturdier like a metal post. Both of the sticks that snapped were the only support for the entire plant. I used multiple stakes for some of the other plants and they are as good as gold. I'm still having fun growing the tomatoes up, just wanted to let you know some of the troubles I'm having in case you ever decide to give this method a try. I hope wherever you are, if you are growing tomatoes that you are having fun with them! For my first ever batch of jelly using my steamer I bought a flat of strawberries for $20 from a local chemical free farm. If I really wanted to be thrifty I would have picked my own at a U-pick farm or called around to find a place willing to discount their day old strawberries. I was a little worried that the waste no morsel, thrifty me would have a hard time parting with the flesh of my strawberries once the juice had been extracted. I found that the steamer sucked the strawberries so dry I had no problem getting rid of the remaining bit of brown mush! It went straight to the chickens without another thought. I drained my juice into an eight cup measuring cup before putting it into a large pot in order to keep track of how much liquid I had so I would know how much sugar and pectin to add. Here goes a free endorsement for Pomona's Universal Pectin which is a little expensive at around $5 a box but a fantastic product for thickening jelly with very little sweetener. For my flat of strawberries I used one box of pectin. It is well worth the expense if you don't want to add all the sugar needed to get the traditional pectin to set. My flat of strawberries yielded about 19 cups of juice. I followed the directions that came with the Pomona's Universal Pectin. It gives a range of measurements for each type of food and the sweetener you are working with. I used the lower range and added 2 cups of Raw Cane Sugar to my juice. Had I been following a traditional or typical recipe for strawberry jelly for 19 cups of strawberry juice I would have used 38 cups of sugar! You can also use alternative sweeteners like honey, agave an even stevia with the Pomona's Pectin. The directions specify if you need to add any lemon or lime juice or citric acid depending on what you are canning. Once you extract the juice from the berries, mix in the pectin, sweetener and any other ingredients or spices you wish. Just follow the directions that come with the Pectin! Before you ladle the jelly into your jars make sure the jars are piping hot. It works to either have them in the dishwasher being warmed or to fill them up and place them in the canner while you bring the water in the canner to boil. When you remove the jar from the canner, pour the hot or boiling water from in the jar back into the canner. You can also have a bucket or pan of hot water to keep the jars in. Unless specified, most recipes assume a hot jar and hot contents of the jar and base water bath or pressure cooking time on those criteria - that the ingredients and jar are hot. I have always seen my grandma boil the flat lids in a small pan. After filling the jars she dips the edge of a clean dish rag in a pan of boiling water and wipes the rip of the jars with the hot water prior to placing the lid on. However I was recently canning with a friend who told me it is no longer necessary to boil the lids, that lids these days are made with a different kind of material that do not require being boiled prior to placement on the jar. My friend rinses the rim of her jars by dipping her clean fingers in a bowl of hot water and running it around the rim. That method totally works. I will probably continue to use a pan with boiling or maybe just hot water for the lids because I like to have hot water ready in case I need to top off the waterbath canner. After the jars are filled and the rim is wiped you put the flat lid on. I use a magnetic lid wand to handle the lids though while convenient it is not necessary especially if you are not boiling your lids. After the flat lid is on place the rims over the lid and tighten with your fingers. The rims are just to keep the lids in place before they seal. Lower your jars into the canner either onto a rack that is resting on the canner to be lowered in or all the way in to begin with. Start your cooking time when the water is at a full boil. The jars should be all the way covered with water. When the specified time for cooking is up turn off the stove and remove the canner lid. If you want you can lift the jar rack up and rest it on the rim of the canner. Wait a few minutes to help with pressure adjustment and then using a jar lifter pull all the jars out of the water keeping them as upright as possible. I lost my jar lifter (or left it at my friends – who knows) and have twice now made due by using an oven mitt to carefully handle the hot jars. I just share that to encourage possible rookies who don’t want to buy a hundred tools for canning. All you need really are jars, lids and a pan big enough to boil the jars in. The best part of canning for me is hearing the jars seal. They give a quick satisfying pop soon after being removed from the canner! I also love seeing the colorful jars all lined up on the counter. I usually leave them out for a day or two taking my time putting them away! Before I move my goods to storage I rinse the jars and label them with the contents of the jar if it’s not painfully obvious and always a date (month and year). You can buy fancy labels, use a permanent marker on the lid or slap on a piece of tape on. My flat of strawberries yielded me twelve pints of jelly which accounting for ingredients only cost me a little over $2 per pint, a price well worth it for the security of knowing I have a healthy product of which I know the contents. I’m totally sold on my juicer. It is really the easiest way in the world to make quick and easy jelly. I can’t wait to experiment with other uses for my steamer!